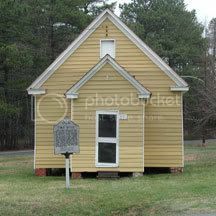 Rock Elementary School, a one-room, one-story, gable-front schoolhouse, is located at the southeast corner of the intersection of Bayly Road and Church Creek Road, approximately two miles from Cambridge, in Dorchester County. The school faces the Rock Methodist Church (built in 1875) and Cemetery off Bayly Road. The date of construction for this building is unknown. In 1867 a building known as Rock School was moved to the present location from a site near Church Creek. The current building could be the original Rock School or it could be an 1867 construction made with the dismantled and reused parts of the Rock School. The building is referred to as Rock Elementary or as the Stanley Institute in honor of the first president of the school board, Ezekrial Stanley. (National Register Nomination) Rock Elementary School is significant for the role it played in the education of the African-American children of Cambridge from the mid-nineteenth century until it closed on July 15, 1966. Rock Elementary measures approximately 38 feet deep by 18 feet wide, including a vestibule which measures 8 feet by 13 feet. The schoolhouse rests on brick piers and the gable roof is covered with wood shingles. The exterior design of the building is simple, with decorative features restricted to the boxed cornices with returns and unornamented board window surrounds. The southwest (front) elevation of the vestibule contains a door with four horizontal panels. Above the vestibule roof there is a small opening measuring 2 feet by 1 feet 7 inches, which is currently boarded up, but leads into the attic. The classroom, or main block, measures 29 feet deep by 17 feet wide. The walls contain wainscoting from the floor to the bottom of the window sills. Above the wainscoting the walls are painted white. In addition to the windows the southeast wall contains a blackboard measuring approximately 7 feet wide. The northeast wall contains a blackboard, chimney stack, and a door to the exterior. 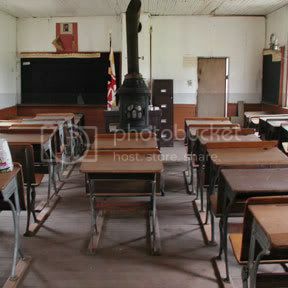 The interior space of the classroom contains “Eclipse” wooden student desks and an iron stove made by the Orr Painter and Company in Reading, Pennsylvania. The teacher’s desk, located in front of the chimney stack, faces the children’s desks. The classroom and vestibule contain various items that speak to its previous use as a school.